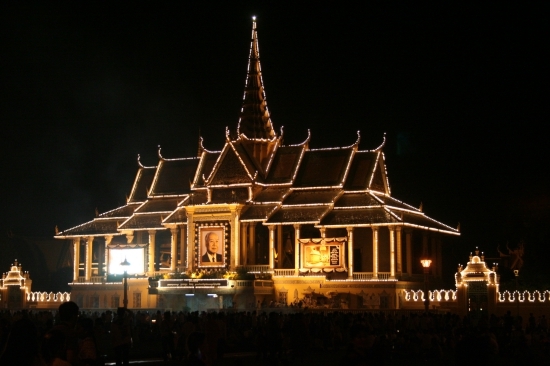 The death of former King Norodom Sihanouk, aged 89, on October 15 during the Pchum Ben festival is being mourned by Cambodians. Increasingly frail, the King Father’s last visit to Cambodia from his home in China earlier in the year proved to be his last. 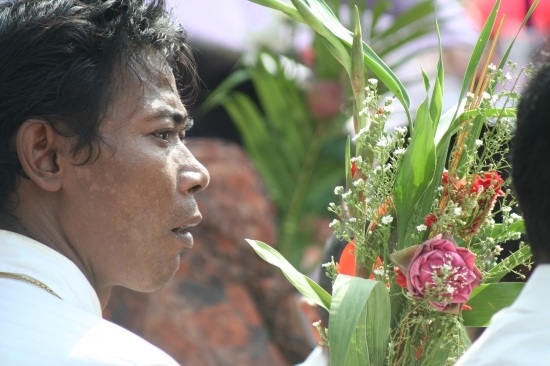 His death has saddened but not surprised Cambodians, who are paying their respects in different ways. All ages gathered to see the King Father’s coffin. Local television channels are showing old films of Sihanouk in his prime, with plenty of focus on independence from the French in 1953, probably his finest hour; the 1950s and 1960s are remembered by many as Cambodia “golden era”. These broadcasts are worth tuning into for their historical context, even if you can’t read the French subtitles. Sihanouk abdicated in 2004 in favour of his son, Norodom Sihamoni, but remained a revered figure, and held status as Father of the Nation. 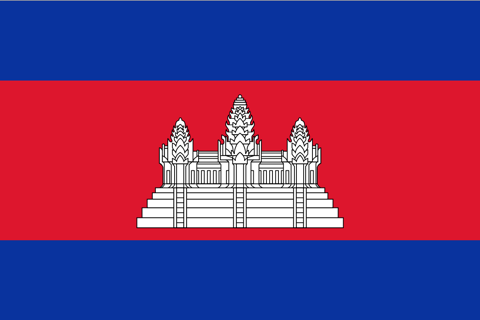 Cambodian flags have appeared on roadsides and outside official buildings at half mast, and mourners have also given prominence to the blue and gold royal flag. Facebook is covered with tributes and, confusingly, many people have changed their profile picture to the King Father’s official portrait. Mourners pass a flag at half mast. On Wednesday October 17, crowds in Phnom Penh lined the route the coffin took from the airport, with thousands along the street named for the King Father, Norodom Boulevard. 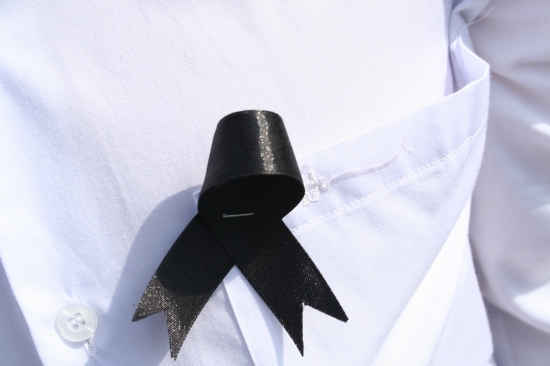 A black ribbon or a square of cloth fixed to a white shirt is the mourning uniform of choice, with many also pinning a prayer for Sihanouk underneath. Black ribbons are the symbol of choice. Clutching bundles of white and yellow flowers, incense and flags, they waited for hours in the baking sun for the cortege to pass. Print shops passed out photocopied portraits, while older mourners brought framed pictures from home, wrapped in yellow ribbon. 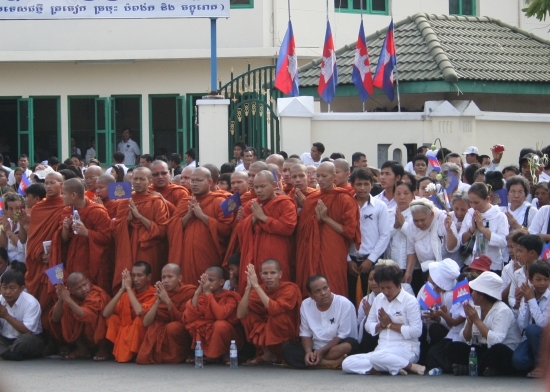 Monks, nuns and laypeople displayed the traditional mark of mourning with freshly shaved heads. The crowds were relatively subdued. As groups of monks began chanting, a few people wept quietly, while most put their hands together in prayer. When the golden floats passed, displaying the coffin and large images of the former monarch, a few more tears were evident. Flowers for the King Father. Outside many pagodas, shrines of candles and photographs have been set up where people can pay their respects, and the large images of the King Father at the palace and by the Independence Monument have been wreathed in black and white ribbons. The Royal Palace has become a focal point, with crowds gathering outside to burn incense and candles and sign a book of condolence. The former king will lay in state for three months until a funeral is held (see below). Monks lead prayers for waiting crowds. 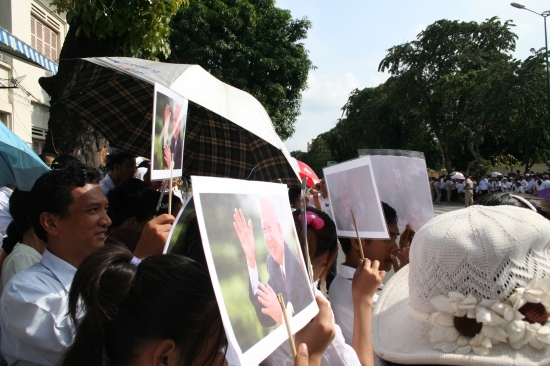 It’s been an historical weekend in Phnom Penh, as the King Father, former King Norodom Sihanouk, was finally laid to rest. 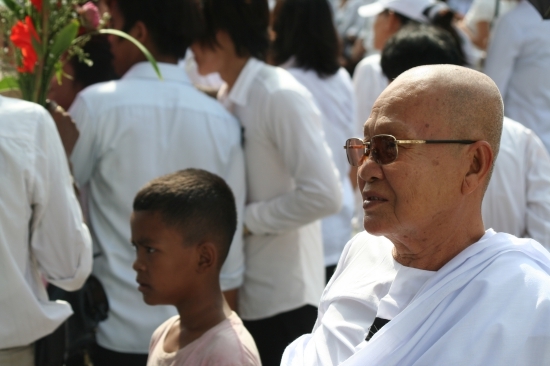 Many of the rumoured 2 million mourners stayed at home and got a better view on the TV, but the streets were still full of Cambodians and a few Westerners dressed in sombre black and white. The weekend began with the funeral procession on Friday, which included representatives of the government, armed services, minority tribes and scouts. The casket finished its six kilometre-long journey at the cremation site in front of the National Museum, where it was raised into position after making three circuits of the park. 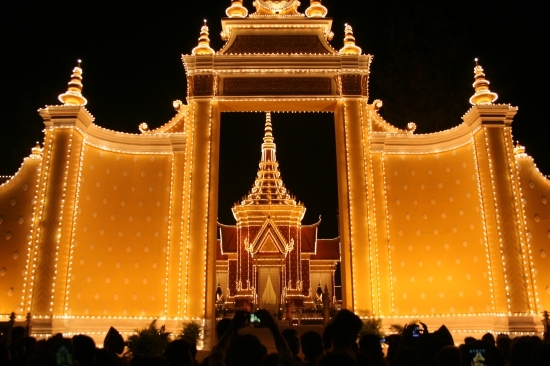 The Royal Palace was a focal point for mourners. In the evening, funeral music was gently broadcast from PAs around Wat Phnom, along riverside and at the Independence Monument. Subdued crowds gathered to see the crematorium, fairy-lit and ethereal, surrounded by huge vases of white flowers. Outside the palace, incense fogged the air and people knelt to chant. Fireworks, a major feature of the weekend’s itinerary, set the seal on the first day. Over Saturday and Sunday, visitors queued in long lines to pay their final homage to the well-loved former king, kneeling before the coffin and burning incense. 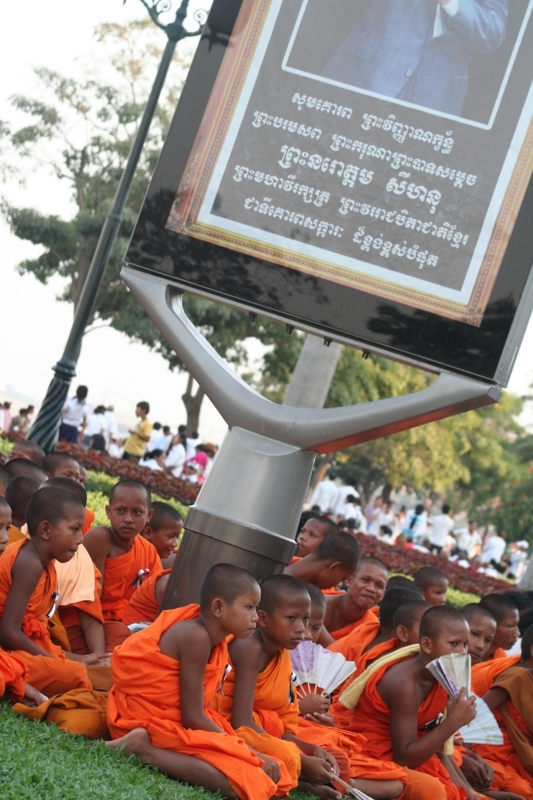 Young monks gather under a tribute poster. 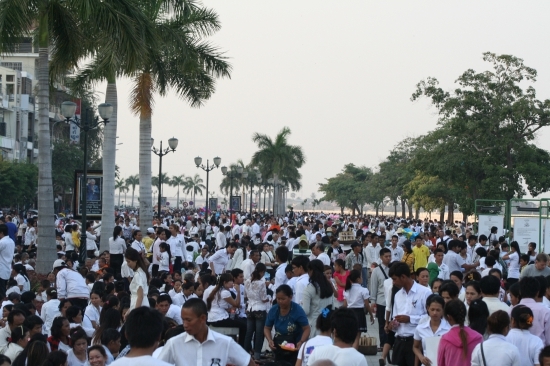 On Monday, tens of thousands gathered on riverside to be close to the cremation site and the palace. The mass of black and white was broken by the occasional splash of a monk’s orange robes. 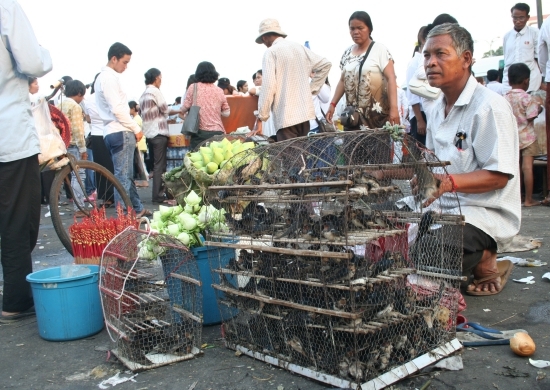 Women squatted by mats, serving nom banh chok and corn on the cob to hungry mourners. Impromptu stalls offered laminated pictures of the King Father in different roles — as monk, soldier, family man and statesman. Standing on tip-toes at barriers, the crowds stretched for a glimpse of the tip of the funeral pyre or the cannons facing the Mekong, which would announce the lighting of the fire. Devotional supplies: lotus flowers, incense and birds. The 3,000 selected guests inside the funeral site included the prime ministers of France, Vietnam, Thailand and Laos, various ambassadors and Prince Akishino of Japan. Just after 18:00, following a beautifully rosy sunset, King Norodom Sihamoni and his mother lit the funeral pyre. To a soundtrack of exploding fireworks and traditional Khmer music, white smoke slowly began to emit from the chimneys at the top of the ornate structure. A minute’s silence was observed along riverside, as many, particularly older people, allowed the tears to come. The king’s grief was also obvious, his shoulders heaving as he was comforted by his mother, wiping her eyes. Crowds gather for a final view of the King Father. To finish the ceremonial weekend, on Tuesday some of the royal ashes were scattered from the royal barge into the river where the Mekong meets the Tonle Sap and Tonle Bassac. In accordance with Sihanouk’s wishes, the remainder will be placed in the grounds of the Royal Palace. One of the most impressive memorials. 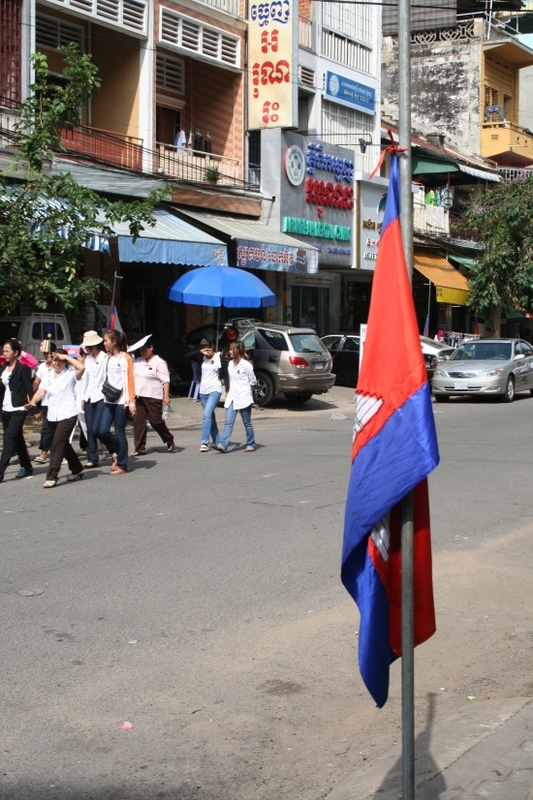 Following the end of the official week of mourning on Thursday February 7, Phnom Penh will be back to the usual bustle, parties and laughter. The overloaded minibuses are returning visitors to the provinces, and the roadblocks have been lifted. 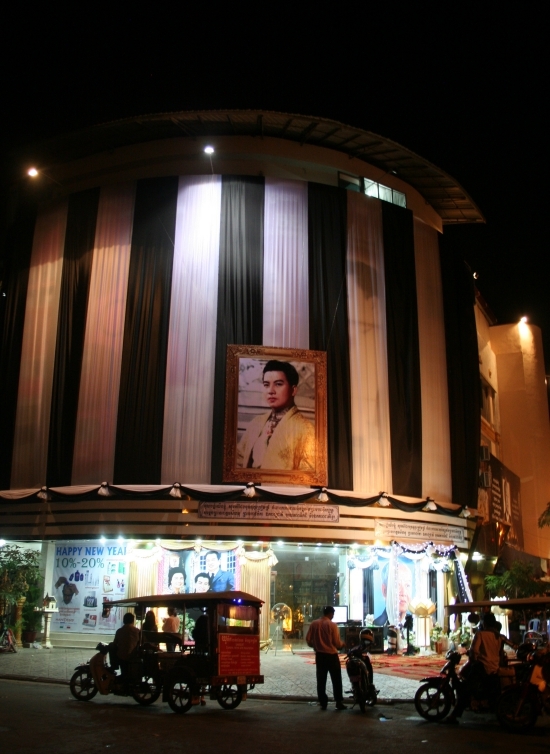 The large scale memorial photographs outside businesses and ministries will be dismantled. But those laminated pictures of an unquestioningly loved king will be pinned to domestic walls for years to come.